Okay, let's try working an Ally Template/Plug-in and see what we can do with the post and if this is something the community wants continued. What we'll try to do here is look at a base concept one would want to ally into their army and why with options around that. We'll start with a pretty easy one - Necron Flyerwing. Flyers & Mobility: The name here should give it away but in case it has escaped your notice, the majority of the options being brought here are housed in Flyers and this means a couple of things. First, they're fast. So everything we discuss below can be brought to bear relatively quickly. Secondly, they're hard to hit and this makes them quite suitable for even foot based armies (i.e. Tau). This can add an extra dimension to more backfield (i.e. Tau) or midfield (i.e. GK) lists without compromising the parent army's strengths. Firepower: The main reason you bring in the Necron Flyerwing as an Ally is straight up firepower. With two Tesla destructors on flyer platforms + a line of S10 AP1 doom, Necrons bring pretty good anti-vehicle and anti-infantry firepower. It's not spectacular at the levels they are bringing it but being flying platforms really helps let them apply this appropriately. Add in Warrior/Immortal firepower and what the Overlord in a Barge is capable of doing and you can plug a lot of firepower based holes in your army list with one Allied contingent. Importantly as well, the Scythes are capable of running air superiority and dropping enemy fliers rather than having to rely upon other means of dealing with such. Scoring: Although firepower is the main reasoning behind taking the Necron Flyerwing as an Ally, its because of the way that firepower is applied (see Flyers & Mobility) and the utility the units bring. Part of that utility is the ability to protect two scoring units quite well thanks to Night Scythe special rules and be able to drop them where and when they are needed - i.e. late game on objectives. This is why taking this Allied contingent with Tau, CSM, Orks or Grey Knights is a far better option than with a parent army classified as Desperate. The firepower and platforms it brings are nice but it's the scoring flexibility that really makes this a good Allied contingent. Utility & Options: HQ is where most of this is at. The Overlord in CCB is a nice staple of most Necron lists but may not always fit in as an Allied force. This is especially true plugging into foot based lists - the flyers are fine because they are flyers but the Barge? Sticks out like a sore thumb. 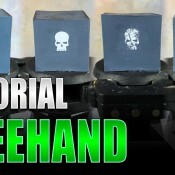 Running the Overlord as something else - i.e. Illuminor or simply on foot is obviously the best bet here. Remember though, Illuminor doesn't give you access to a Court. Anrakyr on foot or in the Command Barge is once again a fine option. The Royal Court option brings some nice utility to the Flyerwing Plug-in. Crypteks can bring a load of nifty little options though the Volatic Staff is probably the most likely to see use otherwise the lovely Solar Pulse. The Staff makes the squad he is with a very reliable glance machine to strip hull points from vehicles - specifically higher AVs whilst the Pulse gives the army some cover utility board wide once per game. Other options are certainly usable as well such as the Crucbile & Harp but it's important to remember these guys are generally holed up inside Night Scythes. You don't want them too important/expensive forcing you to get them out when there's little need. Same goes for upgrading the Warriors to Immortals - a fine idea just be careful how you're using them and how the rest of your army goes. If you've got say six Strike squads and you're putting down two more Immortal units with Crypteks, well that's fine and dandy but if you have six Acolyte squads, you want to keep those units in the Scythes to be mobile scoring options. Fast Attack has some of the nicer Necron options though a lot of them don't fit too well into other armies. Scarabs are less scary than they were before and most other armies have you know, meltaguns. They can be a nice addition as an aggressive bubble-wrap but you can only get one squad and no Spyder support so this limits their usefulness. Wraiths are likewise limited as single squads but are decent if you're looking for an aggressive assault unit. Don't expect them to survive much around S8+ firepower though or walk through any half-way durable units either. Elites are pretty meh - better units in other books generally and the only other option we'd really want to look at is the Doomsday Ark in place of a Doom Scythe (single Annihlation Barges aren't great). With changes to how blasts work against vehicles, the Doomsday Ark can bring some decent firepower to the table now and although it detracts from the Flyerwing flyer style, is an AV13 backfield vehicle with a nice weapon. All things which have improved slightly in relative comparisons in 6th edition. 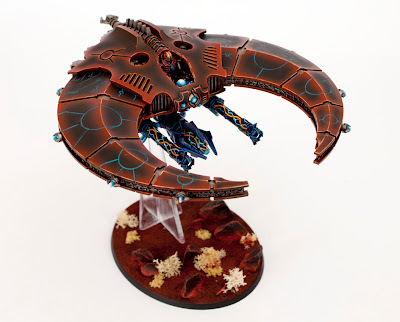 The Necron Flyerwing is a great addition to any army really though particularly for those who can take them as Allies of Convience. Losing the ability to drop Warriors on objectives late-game makes this option a lot less worthwhile but still brings added firepower and mobility which important is effective against all army and unit types. With a few tweaks you can add some extra utility through other unit options as well, upgrade what you have or even cut back in terms of what the Overlord is doing. I.e. flexible Ally plug-in which is flexible in how it's enacted. Sounds good.